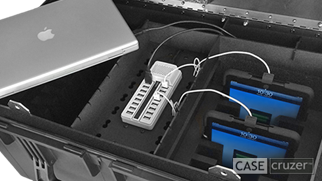 The CaseCruzer Multiple iPad Charging Station is ideal for IT and MIS professionals. 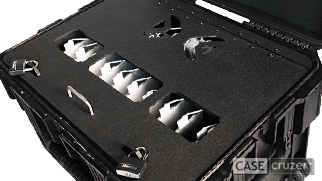 The rugged portable solution is designed to withstand harsh weather and the rigors of the road. 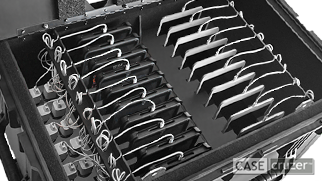 The iPad charging carts can be locked down while they are charging. 6 iPad 9.7" - 10.5"
Six pack iPad Charging Station charges iPad 9.7" up to the iPad Pro 10.5". 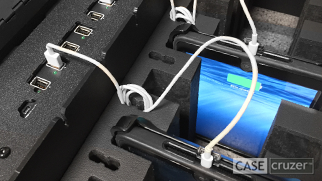 Charging station allows for six iPads or 12.9" iPad Pros to be charged using USB ports. 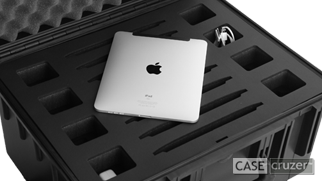 Mobile Charging Station options for iPad Mini, 9.7", 10.5", iPad Pro 11", or 12.9"
Charge ten 10.5" or 12.9" iPad Pros (lightning) with the USB Charging Station. 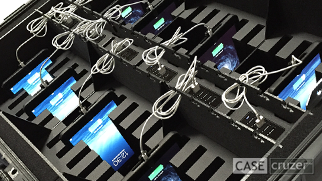 Charging Station for iPad Mini, 9.7", 10.5", iPad Pro 11" or 12.9"
Charging station will charge and transport eight Chromebooks. 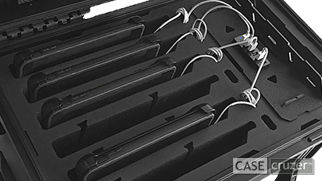 Charging station charges up to ten Macbooks, Macbook Pros, or Macbook Airs. 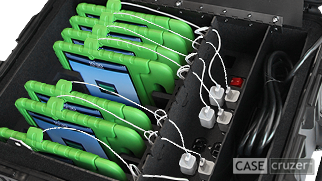 Charging station can be customized for various tablets including the Apple iPad, iPad Mini, Galaxy, etc. Please call 909-613-1999 for more information. 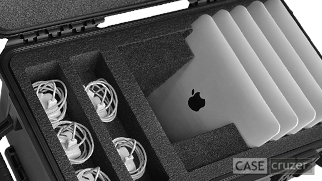 These cases are designed to protects iPads or iPad Minis with individual cutouts for chargers. 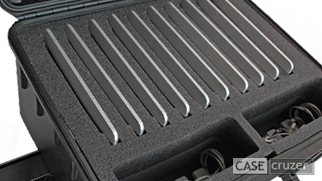 Cases are padlockable, airtight, watertight, and dustproof. 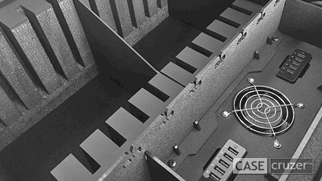 Shock Protection - Tablets are held in place and protected against the damages caused by impact and vibration. 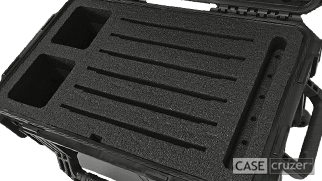 Convenient handle locations allow for one or two individuals to transport, whether loading into a vehicle or going up stairs. 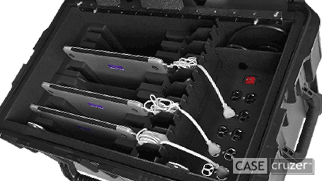 Theft Prevention - Additional interior door is lockable and provides inventory control while tablets charge. 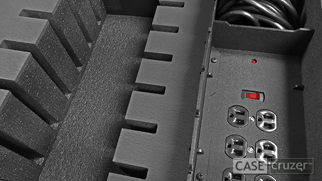 Keep up with Technology - Interior and standard electronics can be upgraded to allow for future tablet models and power supplies. 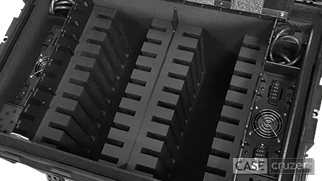 USA - Customer support, engineering, and manufacturing done in the USA. 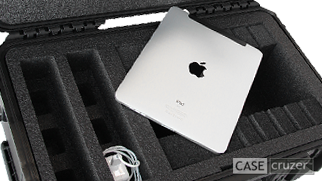 Safe for Shipping - CaseCruzer iPad Charging Stations are airline safe and can be shipped via FedEx and UPS. 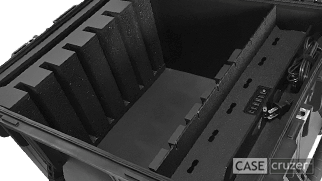 Weatherproof - Rain or shine, transport tablets from building to building with CaseCruzer weatherproof charging stations. 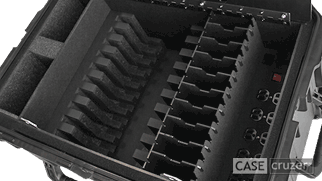 Smaller Footprint Than a Cart - Compact & can be stacked up to 5 high. 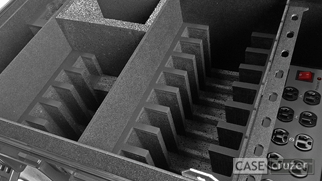 Charging Stations can fit through doorways & be easily stored in a closet. 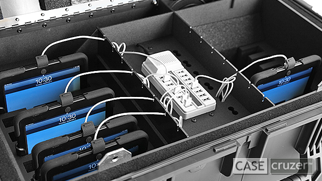 Sync 'N' Charge - When Wi-Fi is not enough, CaseCruzer offers the 15 Pack Sync’N’Charge solution with hard wire syncing. 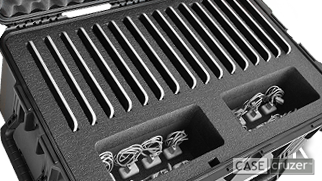 Built to Fit Your Needs - Custom solutions can be designed for your tablets (iPad, Chromebook, Galaxy, etc. 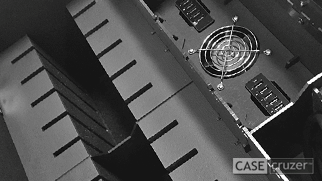 ), covers, additional routers, laptops, and accessories. 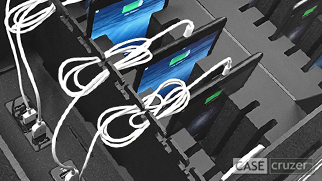 K-12 School Charging Stations - From large tablets with Kiddie covers to small tablets with no covers CaseCruzer has solutions for different classroom needs. 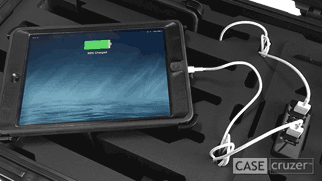 Mobile - Wheels and pull handle make charging stations portable. 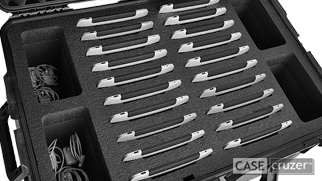 Shipping and Carrying Cases - Transport tablets with the protection they need in CaseCruzer Carrying Cases. 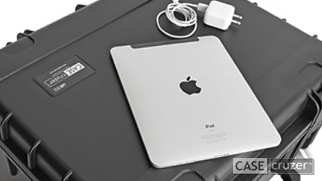 Apple, iPad, iPad Pro, iMac, Mac, MacBook Air, MacBook Pro and MacBook are registered trademarks of Apple Computer, Inc.